At Crawley Cleaners we say no cleaning job is too big or too small and this also applies to Commercial Cleaning. We love to clean and provide a great Commercial Cleaning experience for your property. We are 100% committed to our cleaning business here at Crawley Cleaners and love what we do. So if you would like your Commercial Cleaning in good clean safe hands then call us at Crawley Cleaners. We love cleaning up. Vacuum carpet and non-carpeted areas. General dusting and polishing worktops and surfaces. Hygienic toilet cleaning and basins. At Crawley Cleaners we know the importance of keeping your commercial premises clean. Your customers first impressions are our top priority and we will provide a first class commercial clean to ensure cleanliness is of the highest standard for your customers. Our commercial cleaning packages at Crawley Cleaners are created uniquely to suit your individual needs. We will listen to your own personal requirements for a commercial clean and provide the right clean for you. Whether this be a one off deep commercial clean or a regular contracted commercial clean, we will do our very best for you. So why not let us at Crawley Cleaners take the stresses of keeping your commercial premises clean. 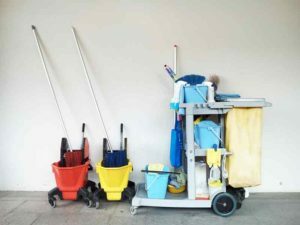 We clean all areas including, kitchen, toilets, reception areas, waiting areas, hallways, bathrooms, staff rooms or any other area in need of a commercial clean. Crawley Carpet Warehouse is one of our regular commercial cleaning contracts. We provide a unique clean for each of their three separate showrooms. Cleaning in very fine detail each individual Carpet, Laminate and Vinyl flooring sample to ensure their customers can relax and enjoy their search for flooring in a clean and hygenic environment. For more information on how we can help you with any Commercial Cleaning requirements you have, call us at Crawley Cleaners on Landline : 01293 279599 or Mobile : 07846 646725 or use our contact form.